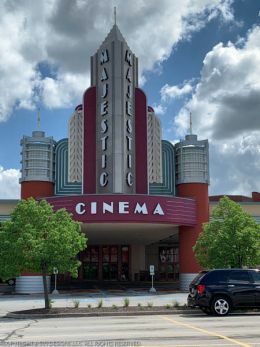 The Marcus Majestic Cinema opened on May 4, 2007. A $12 million facility, its 16 screens include two 72-foot UltraScreens and a live performance theater called the Palladium that is also capable of showing movies in an adults-only atmosphere. The Marcus Majestic Lobby, as seen from the entrance. Photo taken 4/30/2007 Copyright © 2007, SVJ Designs, LLC. The first thing you notice upon entering the theater is the size of the lobby. Much larger than any of their other lobbies at the time, it features a large concession counter along the back wall, flanked by staircases leading to the upper entrances to the two UltraScreen auditoriums. A grand piano is placed in the center of the lobby, and a coffee/ice cream shop and a made-to-order pizza shop serve specialty items not found at your traditional movie theater. The concession stand also offers non-traditional items, such as chicken wraps, hamburgers, and onion rings, all from a full kitchen located behind the concession stand. Other amenities include the "Take Five" lounge, a "Kid Zone" party room, and WiFi Internet access is available throughout the facility. The "Kids Zone" babysitting service was discontinued in 2008. The Majestic's predecessor, the Marcus Westown Cinema, featured Marcus' first UltraScreen installation in 1998. It was the largest screen in Wisconsin, and its features were copied in several other Marcus theaters. The Majestic takes the UltraScreen concept up a notch by having two UltraScreens, and the benefit of several years of experience brings higher performance. According to a Marcus Press Release dated 3/19/2007, which announced that AT&T acquired the naming rights, the Palladium is the area's first multi-use venue, and will "feature an outstanding sit-down dining experience where moviegoers can enjoy the latest Hollywood blockbusters with their meal in an adults-only atmosphere. The AT&T Palladium will also feature live performances, comedy shows and concerts, as well as special movie-and-a-meal events." The Palladium features complete facilities for businesses and groups, including full integration with computer presentations, high-speed Internet access, and other telecommunications access. The Majestic offers more food choices than what is available at traditional movie theaters. The concession stand offers hamburgers, chicken fingers, wraps, french fries, onion rings, peanut butter and jelly sandwiches, chicken sandwiches, and more. The lobby also sports two shops that offer local favorites. Zaffiro's pizza shop offers their famous thin-crust pizza as well as sandwiches and soft drinks. The Stone Creek coffee shop offers moviegoers roasted coffee and ice cream from the Chocolate Shoppe Ice Cream Company. It will also offer hand-made chocolates and candy from the Fun Factory Sweetshop. Located next to the Palladium entrance, the "Take Five" lounge is a place for adults 21 or over to enjoy beer, wine, or cocktails before or after the performance. Alcoholic beverages are not permitted outside of the "Take Five" lounge and Palladium areas. Book a birthday party with packages that include movie tickets, concessions, and activities. The information below is based on observations and/or on information from the theater. Measurements and other data are approximate and may be rounded to the nearest foot. This is subject to change without notice, but is accurate to the best of our knowledge as of May 2010.